The most recent Urban Matters ("Tough Test Ahead: Bringing Diversity to New York's Specialized High Schools") reported on patterns of racial and ethnic admission to some of the city's most prestigious secondary schools and how admissions might more closely mirror the overall composition of the city's public schools. As we showed, only about 16 percent of high-performing Black and Hispanic middle school students gain admission to these elite public high schools. This week we're following up on comments and questions we received from you. First, we show all 7th graders in 2012-13 by race, ethnicity and performance level at all 536 public middle schools (including charter schools). 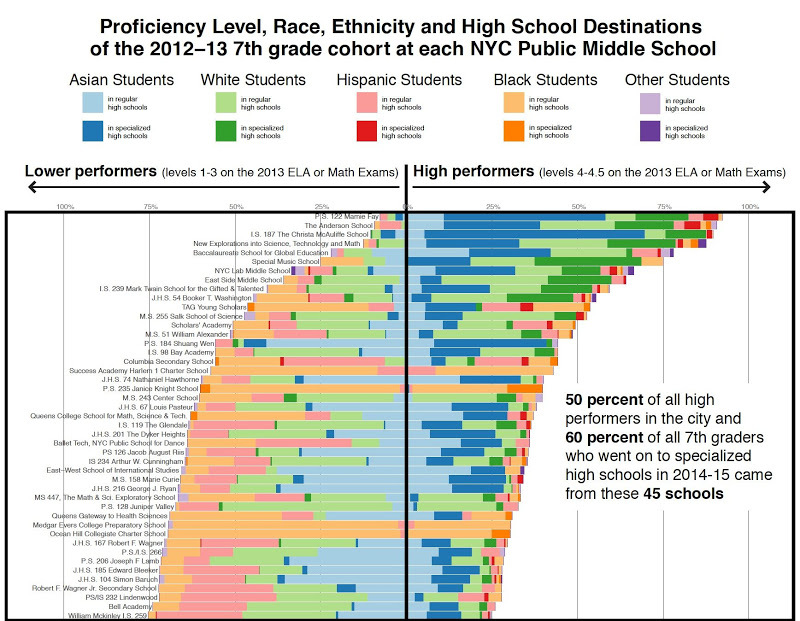 At the top of this chart, we see the handful of "feeder" middle schools that send high-performing students of all races to the eight high schools that rely on the specialized high school admissions tests (SHSAT). But we also see hundreds of schools that fail to prepare any students for these specialized schools. Click here to see the chart. Second, many readers were also interested in specialized high school admissions by neighborhood. In response, we mapped where these 7th graders live and show the communities that sent the highest percentage to specialized schools. They range from zero percent in Far Rockaway and Mott Haven to 30 percent in the East Village. Click on Urban Matters for the interactive version of the map below to see a fuller ethnic and income portrait of the students living there. This research is part of the Insideschools and Center for New York City Affairs' on-going investigation of racial and economic integration in the city's public schools. The research data and graphics were developed by Nicole Mader, senior research fellow at the Center for New York City Affairs and a PhD candidate at The New School's Milano School of International Affairs, Management and Urban Policy. Bruce Cory is editorial advisor at the Center for New York City Affairs and manages the Urban Matters blog. Celeste Royo is an Urban Studies major at Vassar College with a focus on geography and education and is a summer intern at the Center and Insideschools.org.